On Thursday morning we pack our bags at 4am ahead of two adventurous days living out of our Ford Fiesta in the mountains. 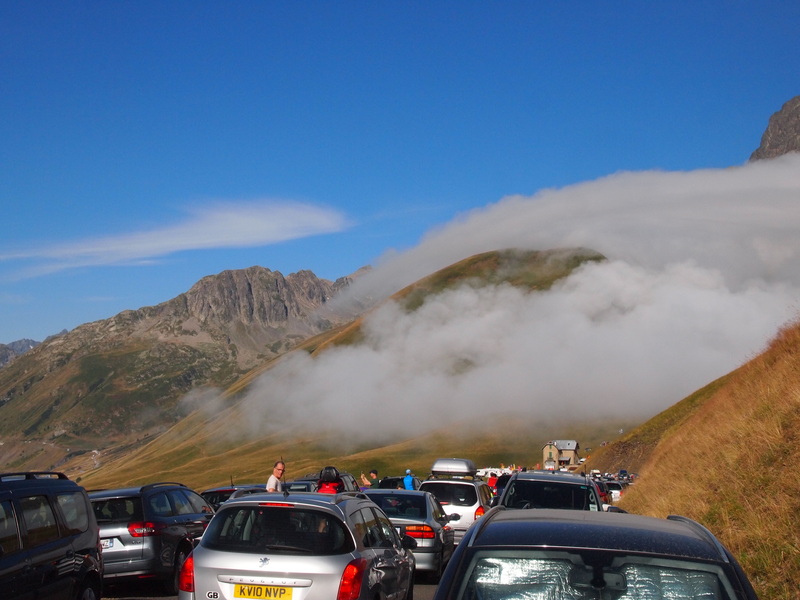 Ben drove the four hours of winding, fog heavy roads – stopping for much-needed plastic knives and forks – to our stake out point on the summit of Le Col de Glandon, the largest climb for the stage. 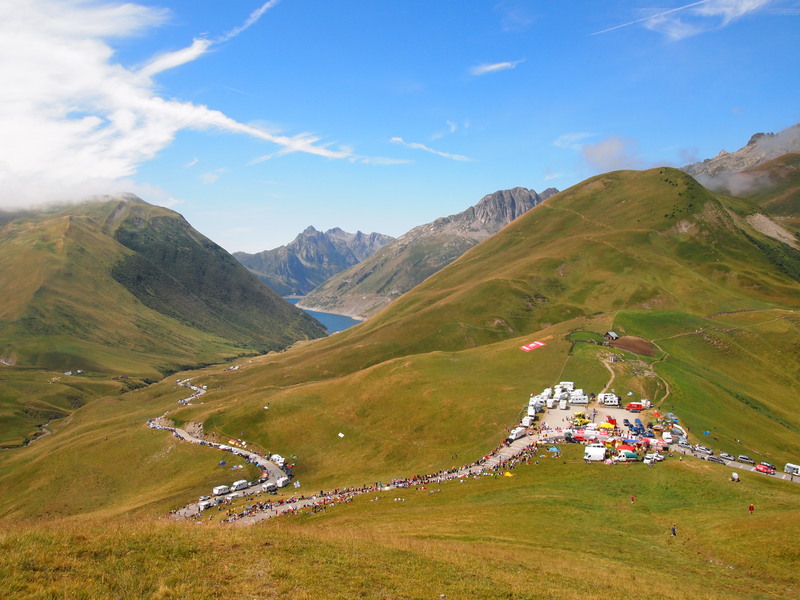 Spectacular views for the stage. Winding through the spectators, sheet, cows and a waterfall watch on nearby photo by Ben. Scraping inside the road closures with minutes to spare and lucking a great carpark ( a logistical nightmare at 8am) within 1km of the Glandon on the cliff face edge, we packed our day bags, sun-screened up and headed into the cloudy summit for a nine-hour stakeout. Unsure of where we were stuck in the clouds we sourced pipping hot coffee made with a generator and ate our boiled egg breakfast hoping it wouldn’t be cold and dark all day. As the fog lifts, the lines of cars hoping for a car space becomes clear. As the clouds and fog lifted a beautiful site struck, not only of the cavernous mountains we’d just driven but the scale of support on the side of the road stretched for miles. The sun got hotter and hotter and the ever presence of no toilet for miles started to sink in. Chatting to spectators around our camp, we met many people who were attending their seventh tour, many of whom had been on the mountain for hours already. Basking in the sunshine and damp grassland, we met some fury friends too, it turns out we were sitting on a giant mice nest. One of the little guys even rubbed up against me – the little devil. Fortunately, the wait didn’t seem an age thanks to spectator showmanship and the caravan. Throwing free stuff from their floats, the crowds jump to their feet literally fighting people for the same merchandise they’d received the day before. Men dressed as superheroes, Borat and proud nationals for Colombia, Britain and France all showed their support for the sport. Chowing into the free samples of Haribo and Madelines thrown our way we waited two more hours for the riders to make their way through. This guy makes it up the mountain. The crowd enjoying themselves before the riders come through. We knew the course was close as five choppers transporting VVIPs circled in and landed on the summit. We’re still not sure who was in them but we knew the race was going to fly by as they appeared to be well ahead of schedule. As predicted, faster than the day before, the riders were bunched closer together coming through in small groups of five just a few minutes apart from each other. 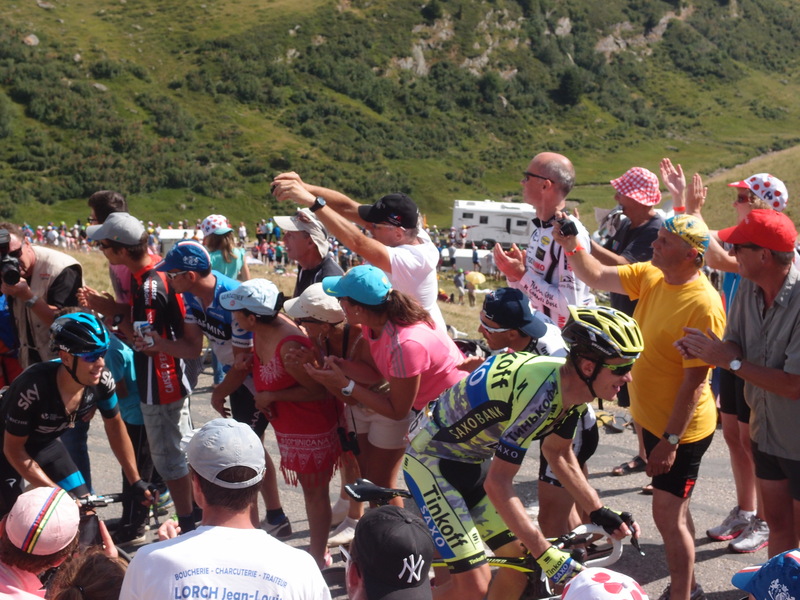 Froome clearly in the lead and comfortably making his way up the mountain, just behind the soon to be caught breakaway riders looked unfazed. Contador went for an early attack it seemed but we saw the end of his final burst, back in his saddle with his head down. Nibali and Valverde were looking strong as a pair, trying aggressively to close in on Froome whom they just couldn’t catch. The breakaway makes their way through the crowds. The five leaders sale past us together toward the summit. They may be on different teams but the Australian riders stick together. 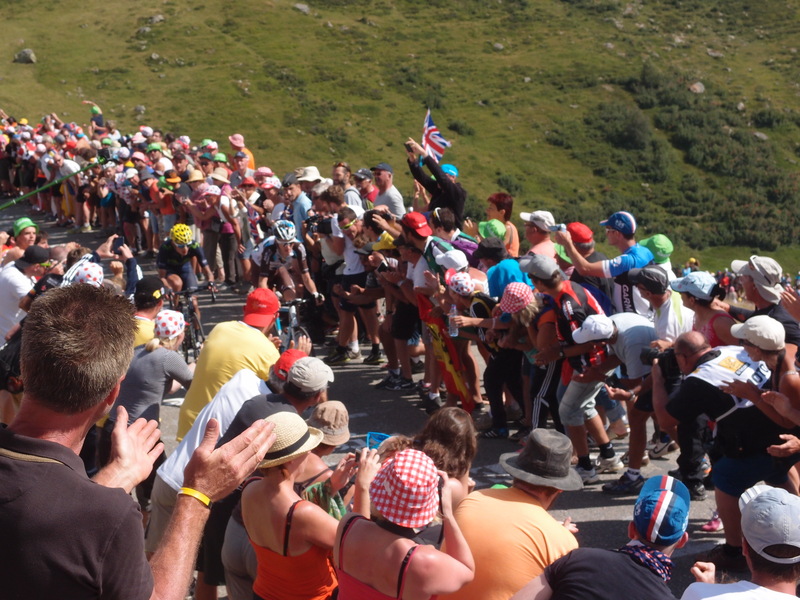 Richie Porte and Michael Rogers tough it out on the summit. 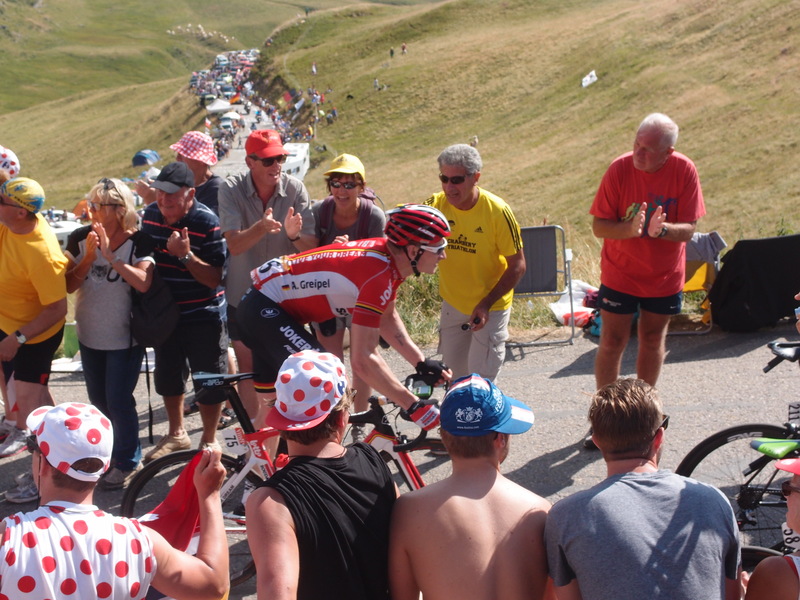 Sprinter and German champion Andre Greipel powers up the mountain. 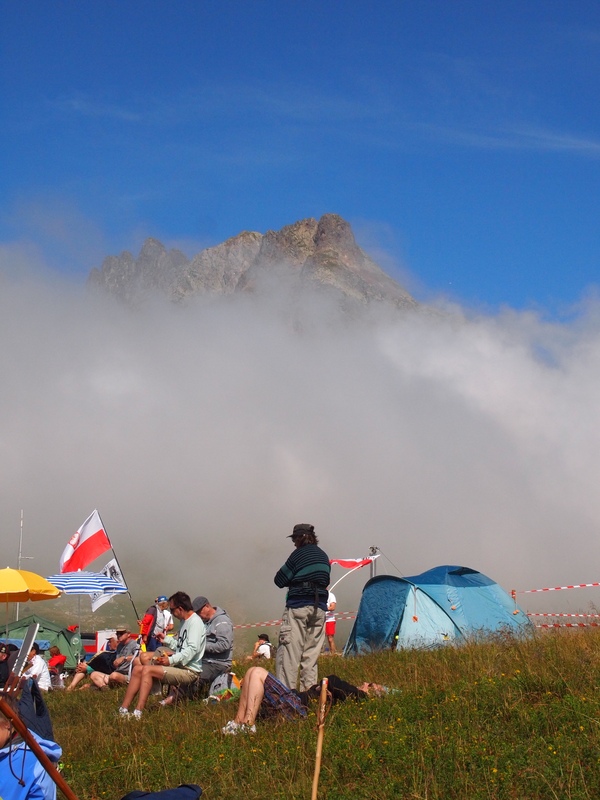 We were in no hurry to move after the stage (luckily, as thousands were trying to get down the mountain) as our spot for the next day was literally one kilometre down the road. Parked in the middle of the two viewing points, we had our wet-ones shower, loaded up on some much needed water, sugar and caffeine before moving the car to our new point 500 metres down the road a few hours later. Setting up camp for the night was easy. With nothing more than our Ford Fiesta, long-life food, one jumper each and a towel, we settled down for a wholesome meal of tuna, baguette, Laughing Cow cheese, chocolate biscuits and chicken chips: a true delicacy. 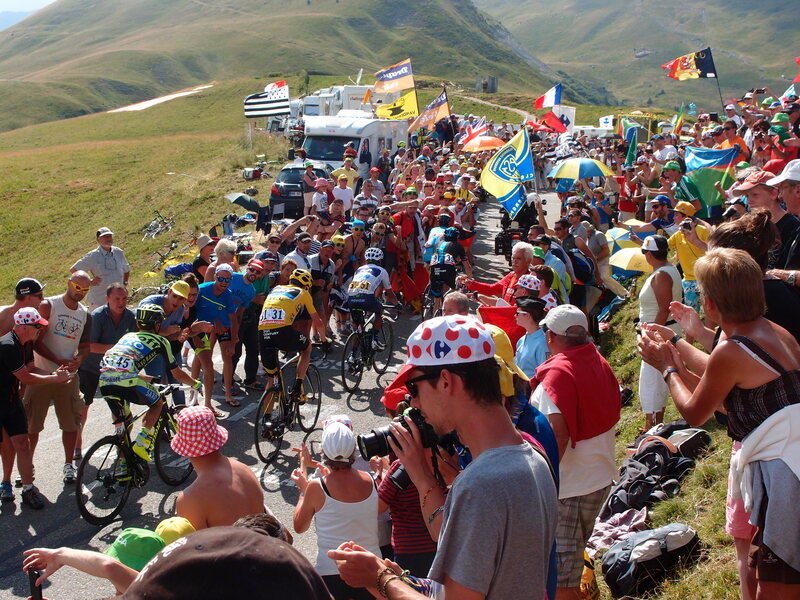 Views of our surrounds as the sun goes down on another stage of Le Tour. 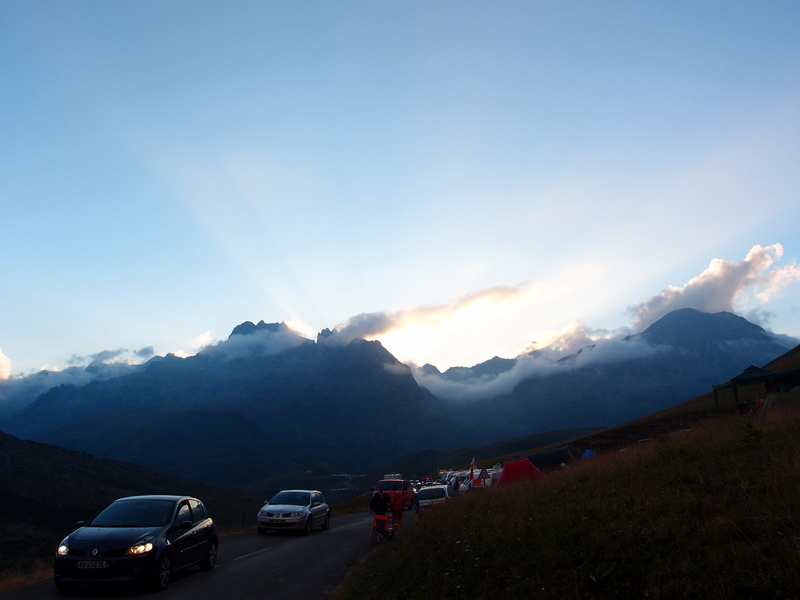 As the sun disappeared behind the mountains and the fog set in, we reclined our chairs, blew up our IBIS pillows – courtesy of the caravan – and wound our jackets into the windows for privacy. By 9pm, we were beat. Our privacy screens soon became extra blankets and our shoes went back on in an attempt to build extra warmth. The night was long and freezing and with headlights making their way onto the course all night long, we resigned to the sleepless night. Tune in for the next to find out if Ben and I made it through the night and controversy strikes the course. Plus more from the Caravan and crowd shenanigans. 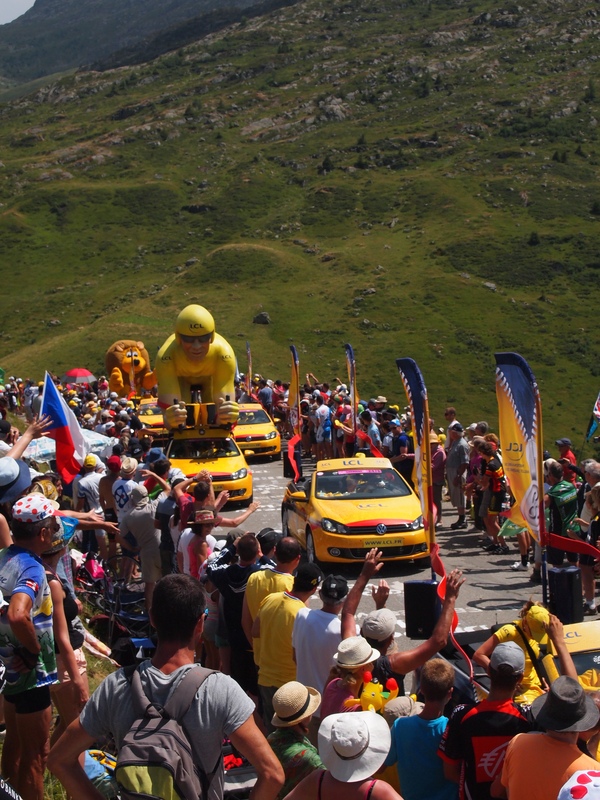 ← Le Tour de France 2015 Stage 17: Digne-les-Bains to Pra Loup.